Oftentimes, we hear that teamwork is the key to success, and that couldn't be more true when it comes to creativity. Putting people together to accomplish tasks allows for an open environment that gets ideas and creative juices going. Whether it's a business meeting, brainstorm session or quick little pow-wow, some of the best ideas stem from collaboration, conversation and socializing. If team building is new to your company, make sure that everyone feels comfortable before jumping into the good stuff. Go around the room, and have each group member introduce themselves just in case everyone doesn't know one another personally. In addition, make it fun rather than formal. With their name, have each person say a little something extra, such as what they had for dinner last night or the closest to a celebrity they've ever been. It will loosen up the crowd, and help the creativity flow. One of the biggest motivators in this world is food. Throughout the day, people get tired and hungry, and the combination of those two is never good for productivity. Stock up your break room with snacks that will get people inspired. Make sure to cover both palette pleasers: savory and sweet. 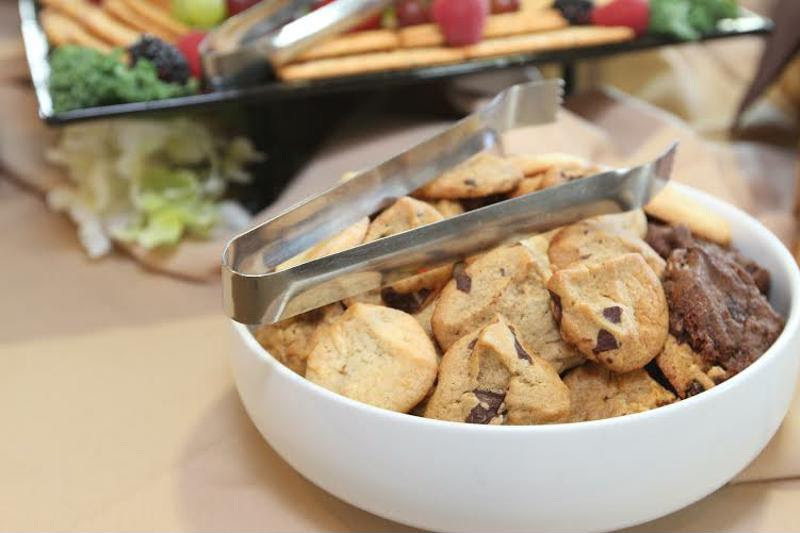 Foods like chips and cookies are real crowd pleasers. Don't forget about the people who want to watch their health, too- include fruits like apples and bananas that are quick and easy to eat. Be sure to compile your break room with snacks like cookies. You may have the snack list ready, but what about drinks? Staying hydrated throughout the workday is more important than you think. Lack of water and dehydration can cause drowsiness and migraines, so make sure your employees have water accessible at all times. To promote this, try buying the company reusable water bottles. That way, you'll be helping the environment and making sure everyone can meet their H2O needs easily. Last, but definitely not least, stock up on coffee. Not only that, but also make sure there is always a fresh pot brewing. Everyone likes their caffeine at different times throughout the day. Sometimes during the workday, we find ourselves just going through the motions and lacking inspiration. Try to combat this by posting funny or inspiring quotes.The best way to do this is to get a re-stickable whiteboard for writing quotes. Try assigning the quote of the day to different people in the office. Each person will have fun showing off their personality. Buy various colored markers so people can create their own original masterpieces, as well. In addition to inspirational quotes, make sure that your office's decor isn't a bore. White walls and dim lights aren't going to make people happy. Instead, adorn your office with colors, interesting artwork, plants and lots of sunlight. The more your employees feel like the office is happy, the easier it will be to work. Not sure what colors to use? Light blue is said to promote mental clarity and productivity; that is why it is used in a lot of classrooms and schools. Conversely, red can come off as aggressive and limiting. Find what color best suits your company, and go from there. You can also spring for dry erase paint so that ideas can be written right onto the walls.